I first met Patricia Quinn when she was a guest at the Dragon Con in Atlanta, Georgia, in August 2012. 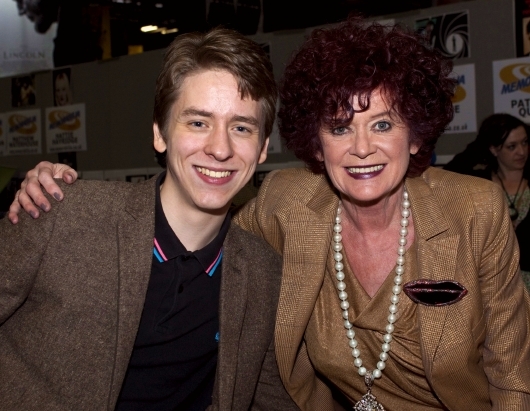 I was pleased to meet the Rocky Horror star again at Memorabilia in November 2012, at the NEC in Birmingham. Patricia Quinn was born in Belfast, Northern Ireland, in 1944. Her father was a well-known bookie, and she has an older brother and a younger sister. At school, she was a champion gymnast. 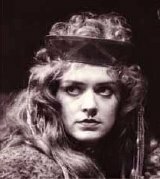 In 1973 Patricia Quinn auditioned for a role in a production at the Royal Court's Theatre Upstairs, that would bring her lifelong fame. 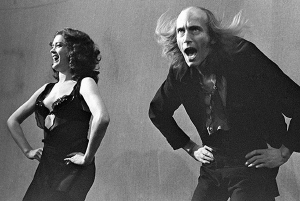 It was Magenta in the theatrical version of The Rocky Horror Show, which began as a 3-week stage show in a small, 65-seat experimental theatre space, and later went on to become a world-wide entertainment phenomenon, which is still popular 40 years later. during the staged musical, but in the film it is sung by the show's writer and composer Richard O'Brien. She again reprised the role on stage for a UK tour in 1994, and has always revelled in the fame that the role has brought her. 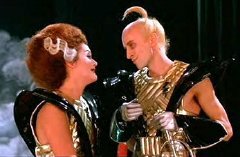 with Patricia Quinn & Richard O'Brien as doctors. Co-written by O'Brien and the director Jim Sharman, the film features a host of well-known names including Rub Wax, Rick Mayall & Barry Humphries. Bristol Old Vic (1976); Susannah in Ayckbourn's Bedroom Farce at the Prince of Wales Theatre (1978); Miss Lowell in Light Up the Sky at the Old Vic (1985) and Dorothy Parker in Wild Women at the Albany Theatre (2005). 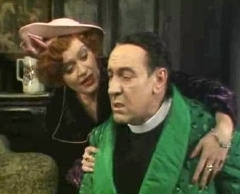 Another notable production was when she played herself in Patricia Quinn Saved my Life at the Edinburgh Fringe Festival in 2004.
appearances in a number of TV productions over a 25-year period. and Livilla in four episodes of I, Claudius (1976). Castlebar in the mini-series Fortunes of War (1987). In both of these, she played alongside her future husband Robert Stephens. She would appear yet again with him in England, My England (1995), a film about the life of the English composer Henry Purcell, in which Quinn is cast as his wife Elizabeth Purcell. Quinn will also be remembered by Doctor Who fanatics as Belazs in the story Dragonfire (1987) back in the days when Sylvester McCoy was The Doctor. comedy The Meaning of Life (1983) and Margot in the drama The Countess Alice (1993). In 1963, Patricia Quinn married the actor/director Don Hawkins and they had a son Quinn Hawkins (b.1970), who is now a barrister. They divorced in 1975, although they still remain on good terms. In 1995 Patricia Quinn married her long time partner, the actor Robert Stephens but within a year she was widowed, following his death after a long illness. She became stepmother to his two actor sons (Toby Stephens and Chris Larkin) from his previous marriage to Dame Maggie Smith. Robert Stephens had been knighted in 1995, giving his wife the title of Lady Stephens. day, in Charles Dickens' A Christmas Carol.